Attention is the skill that enables students to follow through even when the work gets challenging or boring. Attention is your ability to sustain focus, even for tasks or classes that you might not find interesting. Attention difficulties can affect students in all subjects and activities, but it is likely to have the biggest impact in classes that students don’t have intrinsic motivation. 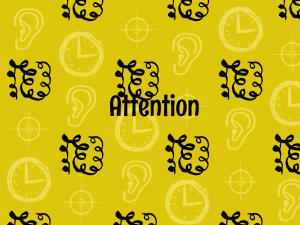 Why is Attention so important ? Quite simply, if you’re not paying attention to what the teacher is saying, you’re not learning. If your mind wanders when you read, you are likely missing out on critical information. If you lose focus while doing an assignment or a test, you are likely to make scattered errors. Attention affects everything you do. Is my student struggling with Attention? Signs of a student struggling include scattered errors, knowledge gaps, or inefficiency. If a student frequently says “I never heard that” it’s quite possible that they are missing key information because they are losing focus. How do I know if my student needs an attention test? If you suspect your child is struggling with attention you should discuss your concerns with a school counselor or your pediatrician. Since learning differences or anxiety could look like attention difficulties, make sure they use an objective test, not just observation. If you are uncomfortable talking to someone but have concerns, try an attention test at home and then make a decision if you need to speak with a professional. How can I Support Attention? If your student’s attention is fine but you’d like to help them be more efficient with homework, there are plenty of strategies. Having a homework routine with regularly scheduled breaks can be a key. Make sure the student’s working with a clean desk and not multi-tasking. Spacing out studying (rather than cramming) is important for students with weaker attention. Also rely on their stronger skills. Every student is different, and the strategies will depend on their unique combination of strengths and needs. Check out our attention test!